In today’s busy tech world, many of us spend countless hours working at a computer. We have all been told how important good posture is at some point in our lives, but who knew it would make such a difference? Many of us have good intentions but, once we get busy, we find ourselves hours later in the least ideal position and pay for it later. Ergonomic keyboards are designed to help people just like us. Their design creates a comfortable typing experience and helps us keep our hands, wrists, and arms in a good position to prevent aching and tiring easily. anti-ghosting with 104 key rollover on USB. There are many brands available that offer different features. We have created this buying guide to hopefully help you choose the best ergonomic keyboard to fit all of your needs. We’ve included a section on who could benefit most from using ergonomic keyboards, features to consider before purchasing, and reviews of 10 excellent ergonomic keyboards. 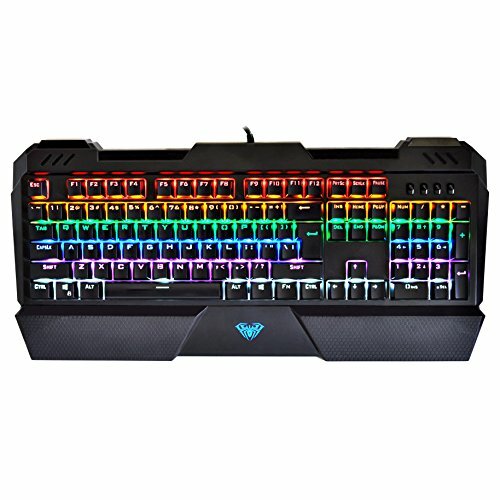 You will find reviews for keyboards designed for Mac users, gamers, cross-compatibility for use with different operating systems, and much more. The easier question to answer would be who wouldn’t benefit from using an ergonomic keyboard. However, there are many people that spend a great portion of their day at a computer. Listed below are just a few examples of people who would benefit from using these keyboards. Writers – From authors and journalists to bloggers, writing requires a lot of computer time. Students – Writing essays and term papers becomes more frequent in high school and college. Gamers – Casual and professional gamers alike spend hours and hours at their computer. Programmers – Programming and data entry require you to be working on a computer more than any other job. Being comfortable is an absolute must. Once you have decided to purchase an ergonomic keyboard, do not forget to consider what is required by your operating system and what features you may want the keyboard to offer. System Compatibility – Make certain the keyboard you purchase is compatible with the operating system(s) that you use. Key Layout – This includes considering whether or not certain keys are important to you such as media shortcuts, specific operating system hot keys, advanced number of function keys, and a number pad. 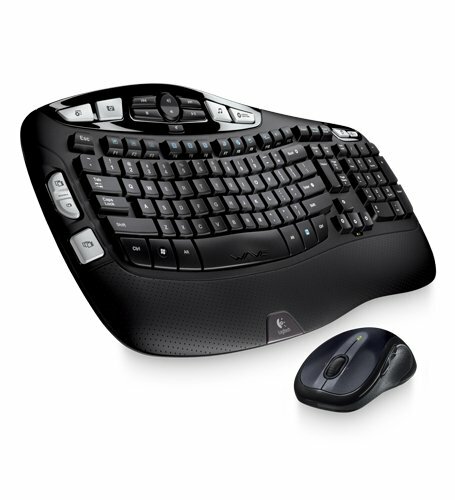 Wired/Wireless – Ergonomic keyboards are available in both wired and wireless with USB or Bluetooth technology. Backlighting – This has become a popular feature on keyboards. Key Type – The 3 types of keyboards are those that use a silicone membrane material under the keys, scissor switch keys (which can offer soft touch keystrokes or tactile feedback), and mechanical keys (which most offer tactile feedback ensuring all keystrokes register). Logitech’s K350 features their Constant Curve design to help guide hands and keep them in a comfortable position. Along with the cushioned palm rest, this design also helps maintain good posture reducing stress on the hands, wrists, and arms. This keyboard has a 3-year battery life based on 2 million keystrokes per year. Media shortcuts and a number pad are also featured. Logitech’s Unifying Receiver allows users to add compatible devices, such as a mouse, to the same receiver. Perixx offers an ergonomic keyboard with a 3-D design. The split keyboard includes a palm rest and helps users naturally hold their hands and wrists correctly. Features include hot keys, media shortcuts, and a number pad. It is connected by wired USB interface. This keyboard has a unique look, and its design will enable users to type comfortably for hours at a time. Microsoft is a trusted name and their keyboards are popular among typists and gamers alike. The Microsoft Sculpt has an excellent reputation for those seeking an ergonomic design. It has a split key design that helps users hold their hands and wrists in the correct position. It has a domed keyboard design and a cushioned palm rest that add extra comfort while typing. The Microsoft Sculpt features scissor switch keys and a separate number pad. The connection is wireless using USB 2.0, and batteries are included. The Kinesis Freestyle2 has a split adjustable design with a standard 9″ separation. This allows users to hold their hands and wrists comfortably reducing strain from long hours of use. The keys are quiet and sensitive ensuring every keystroke registers. This keyboard is designed to work with Windows 7, 8, 10, and Linux. Kinesis also offers compatible accessories including a palm support, VIP 3 and V3 lifters, and a number pad. 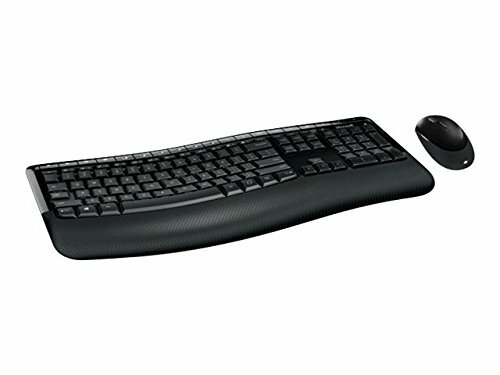 The Fellowes Microban keyboard is a split design keyboard that helps users keep their hands and wrists in the proper position. It is a simple plug and play with a USB connection. The layout features 7 hot keys for media controls, 1-touch internet access, and a 16-character buffer for fast typists. A unique feature is the microban antimicrobial protection that keeps the keyboard clean and free from germs that can quickly accumulate on keyboards. Microsoft has a popular ergonomic keyboard with the Comfort Curve design. Along with the built-in palm rest, this design enables users to keep their hands and wrists in a comfortable position while typing. The keyboard features customizable shortcut keys to allow users to access files, programs, media, and webpages with the push of a button. It features AES (Advanced Encryption Standard) 128-bit encryption ensuring your information is protected. This is a wireless keyboard and uses a USB connection allowing a distance up to 30 feet. It is compatible with Microsoft Windows 10, 8, 7, and Mac OSx V 10.4-10.10. A number pad is included on the keyboard. It also comes with a mouse that features Blue Track technology. It will work on any surface. 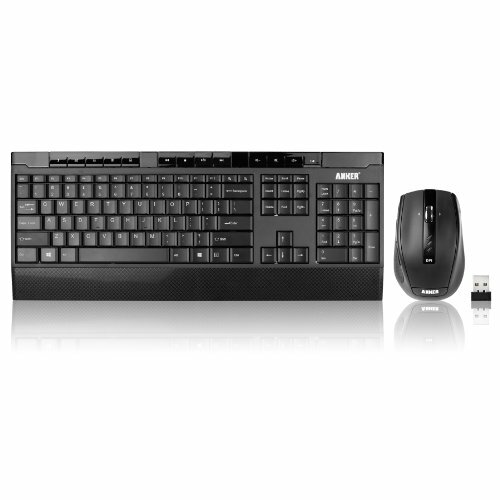 Microsoft offers a 3-year warranty with this keyboard/mouse set, and 4 AA batteries are included. 1STPLAYER offers a mechanical keyboard that also incorporates an ergonomic design allowing typists and gamers long hours of use as comfortably as possible. 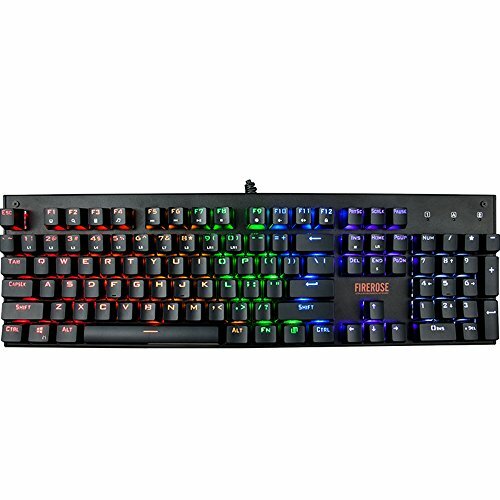 This keyboard includes many great features that a lot of computer enthusiasts are now looking for. It includes LED effects that can be switched to chromatic, marquee, breathing, wave, ripple, single lights, or you can completely customize your own effects. It has 3 brightness settings. The keys are mechanical switches with tactile feedback ensuring every keystroke is recognized and has a 5 million keystroke life. The double-colored injected molded keycaps enable the keys to keep their lettering much longer than other keyboards. In addition, this keyboard features full N-key rollover with WIN lock, 100% anti-ghosting, and a water-proof design. Accidental spills will be much easier to clean with this feature. It includes a 1.8 high quality cable with gold -plated USB interface allowing a fast and stable connection. 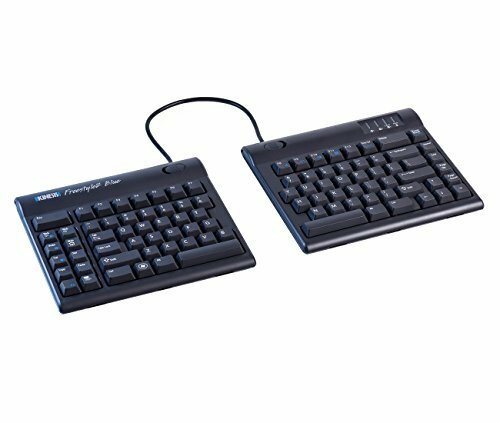 Kensington offers this keyboard that allows the feet (front and rear) to be adjusted 9 different ways ensuring a comfortable fit for anyone. Along with the adjustability, the keyboard has a fully padded wrist rest. 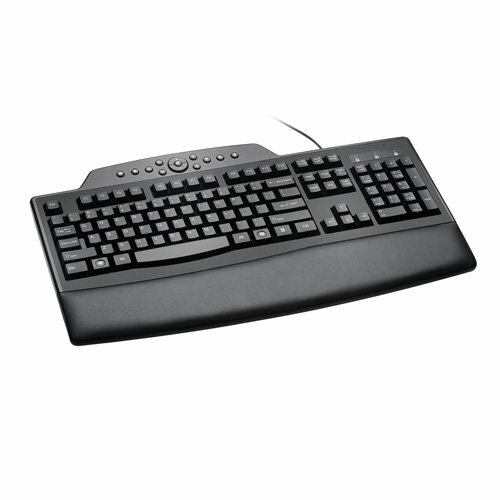 This keyboard has ergonomic features that will ensure proper hand and wrist position for long hours of use. It has hot keys for internet and media. The simple plug and play is wired using a USB connection cable. The keyboard is spill-proof allowing easy clean up in case of mishaps. It comes with a limited lifetime warranty. AULA offers a unique ergonomic keyboard that is available in mechanical and non-mechanical. We used the Sapphire keyboard for this review. It is mechanical, along with the Sapphire Spectrum and the Unicorn AULA keyboards. The Be Fire and Crossfire II are non-mechanical. All 5 keyboards include a large and comfortable palm rest, and all but the Sapphire offer backlighting. The Sapphire features mechanical blue switch keys that include shortcut keys and a Windows lock/unlock key. This keyboard is compatible with Windows 10, 8, 7, Vista, and Mac OS. Anker offers this ergonomic keyboard that features an optimal angled tilt and a palm rest for hours of comfortable typing. The layout includes media keys with a quiet and water-resistant design. It includes a mouse that has 3 adjustable DPI levels and 4 energy saving modes. The 2 in 1 nano receiver allows the mouse and keyboard to be unified into 1 USB port. the Anker CB310 also includes an auto power saving mode and will shut off after 15 minutes of inactivity. We hope you have found this buying guide useful in your search for the perfect ergonomic keyboard. We recommend deciding on the features that are important to you and then reading as much as you can about the keyboard before purchase. 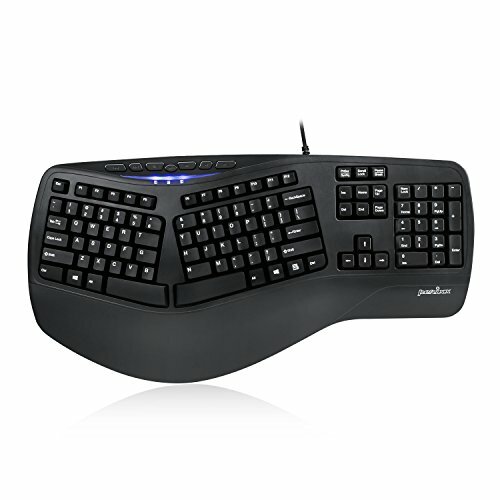 Adjustability, an included palm or wrist rest, and a curved or split design are ideal features for ergonomic keyboards. We wish you the best of luck finding the ideal keyboard to suit your needs.